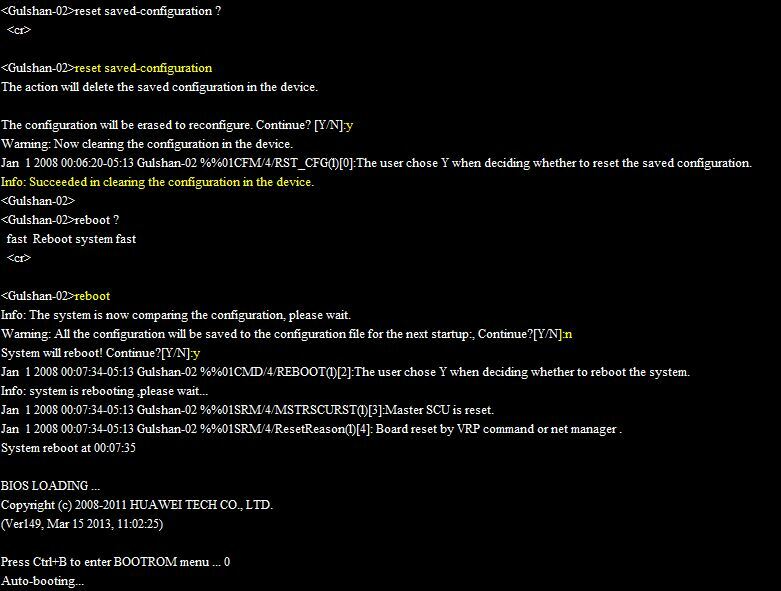 Today i will discuss about how to Delete all Configurations of Huawei Switch. We do it by two procedure. bellow are the procedure. To delete all configurations of huawei switch, delete the vrpcfg.cfg file from the flash memory, and then restart the switch. The vrpcfg.cfg file cannot be deleted when it is running because it is used as the system file. Press Ctrl+Z to enter the hidden menu, and then select option 2 to enter flash memory. Delete the vrpcfg.cfg file from the flash memory, and then restart the device. Type reset save-configuration then confirm & reboot this switch. Also follow bellow image/tutorial. The action will delete the saved configuration in the device. Warning: Now clearing the configuration in the device. Jan  1 2008 00:06:20-05:13 Gulshan-02 %%01CFM/4/RST_CFG(l):The user chose Y when deciding whether to reset the saved configuration. Info: Succeeded in clearing the configuration in the device. Info: The system is now comparing the configuration, please wait. Jan  1 2008 00:07:34-05:13 Gulshan-02 %%01CMD/4/REBOOT(l):The user chose Y when deciding whether to reboot the system. Jan  1 2008 00:07:34-05:13 Gulshan-02 %%01SRM/4/MSTRSCURST(l):Master SCU is reset. Jan  1 2008 00:07:34-05:13 Gulshan-02 %%01SRM/4/ResetReason(l): Board reset by VRP command or net manager . Copyright (c) 2008-2011 HUAWEI TECH CO., LTD. There is no record in region Exception. Press ENTER to get started. The reset save-configuration command cannot delete all the configurations of the Switch. For example, the bpdu enable configuration still exists after the command is executed. Hi! I am Shahed. I currently work as a Sr. Network Engineer. I want to build up my carrier in Networking field. article together. I once again find myself personally spending a lot of time both reading and leaving comments. truly excellent material in support of readers. Excellent blog post. I absolutely love this website. Thanks! I think the admin of this web page is actually working hard in support of his website, because here every information is quality based information. It was definitely informative. Your site is very helpful. Thank you for sharing! I bought an heavy used S5300, the seller had no login information, passwords and so on. Is there anyway I can reset the switch to factory settings? You can try this way, If you have no console password. Is there a way to hard reset MA5600T series OLT? I screwed up and forgot my password that I set during testing. I have searched far and wide but even official manual does not have hard reset instructions? Is it even possible or am I completely screwed? You have a reset button of your SCUN Board. Reset Active & Standby both SCUN card then check. it will erased your All configuration data. It will take you initial stage of your OLT. Sorry, i try the factory reset via bootmenu (CTRL+B) but CTRL+Z dont't show me the hidden menu.The s5700 shom me a menu where the option 5 is:enter filesystem submenu.if i delete the vrpcfg.zip nothing happens.the problem is that my switch remain with the stack configuration in slot 1.can you help me ? Powered by Gpon Solution. | Theme Designed by: Shahed Israr.